Tired of your everyday keto recipes? Kelly Tan Peterson is lighting the low carb keto world on fire with her new book KETO EAST, co-written with her husband Dr. Dan Peterson. Kelly shares low carb keto Asian recipes that “turn Asian classics into ketogenic favorites,” as Maria Emmerich noted in the blurb of Kelly’s cookbook. Give your taste buds a kick in the pants with all the flavor that Kelly brings to the table with low carb keto Asian food recipes that are not just delicious, but healthy too! Originally from Singapore, Kelly Tan Peterson moved to the United States after meeting her husband Dr. Dan Peterson. She began eating a keto diet after seeing how he ate. She watched her own metabolic and weight issues resolve, quickly rebalancing her body and maintaining it while eating keto. What she missed, though, was her traditional diet from back home. Deciding that she did not have to choose one type of food over the other, she found a way to bring her Asian culture into the keto world. This was a challenge she wanted to take on, not only to be able to eat her favorite meals, but also to bring the benefits of ketogenic eating to her friends and family back in Singapore. This began her journey into low-carb advocacy in the spirit of love to inspire those metabolically damaged in Asia to improve their health eating familiar food they loved. What began as a blog and recipe sharing has become a series of books – KETO EAST (already published) and two more to follow: KETO BAKED and KETO WEST. 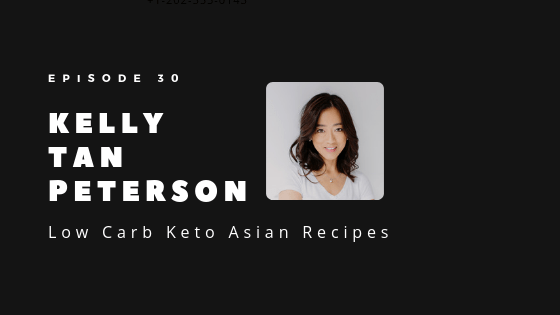 Keep your eye out for Kelly Tan Peterson — she’s spreading low carb keto awareness and delicious recipes — to Asia and beyond!